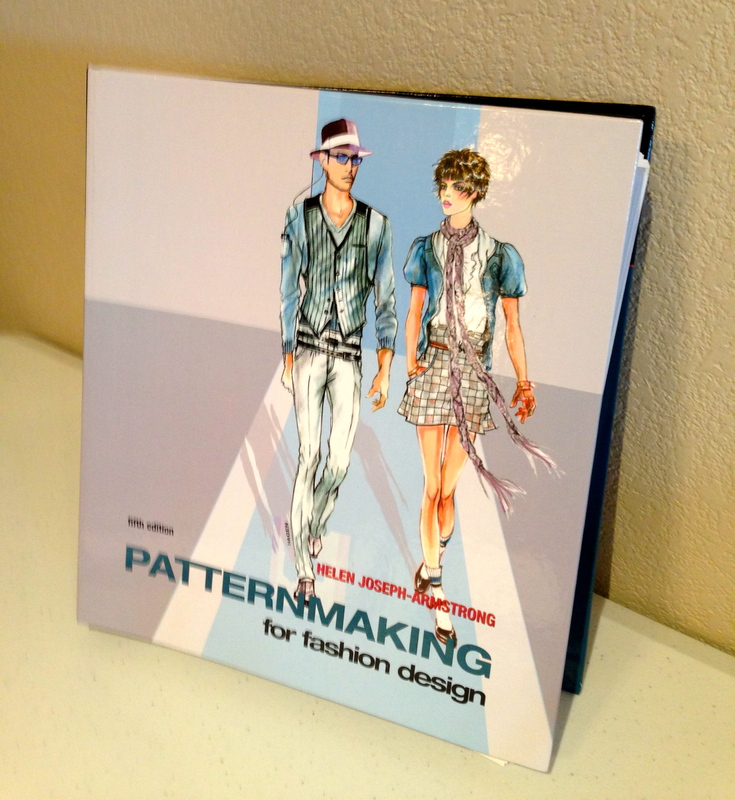 I’ve had the textbook for a year or so: Patternmaking for Fashion Design by Helen Joseph-Armstrong. It’s time to get serious about learning pattern drafting. This is the necessary first step in creating my own designs. Plus, I hear that learning new things keeps the brain sharp, and that’s always a good thing. Forget Lumosity…let’s learn to create patterns and design us some gorgeous clothing! 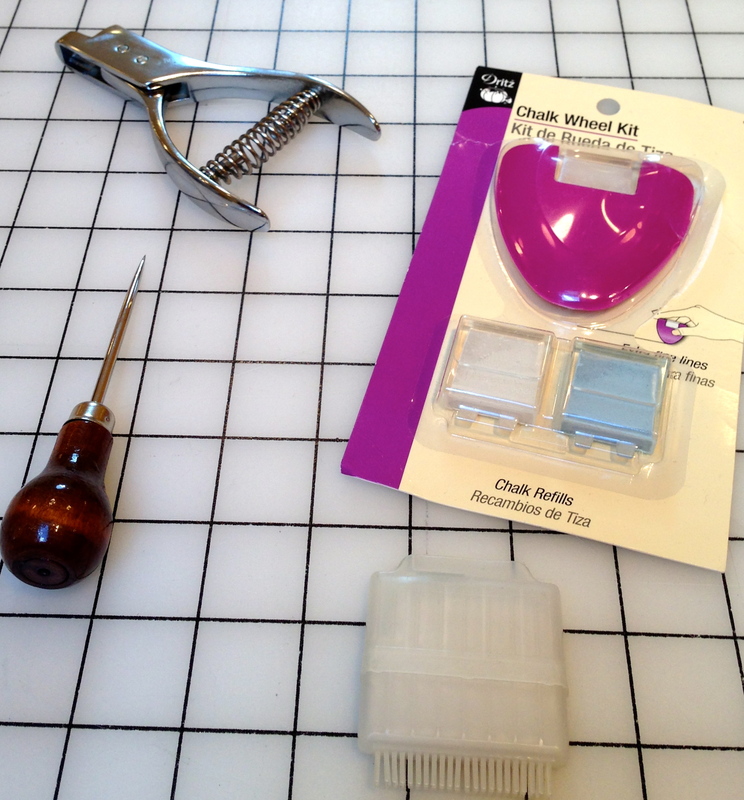 So today, we start with Chapter One: Patternmaking Essentials for the Workroom. 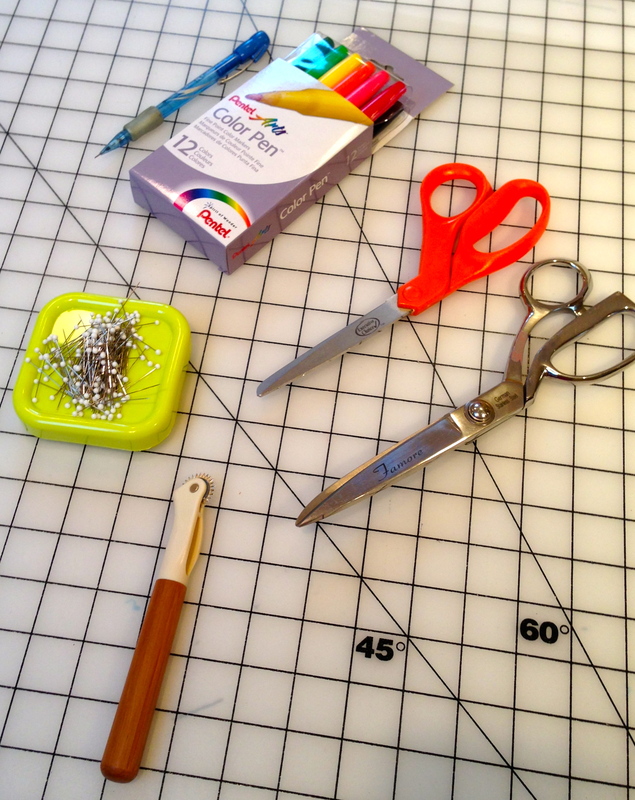 I had many of these tools already, like pins and holder (mine is a magnet), paper and fabric scissors, assorted pens and pencils, a French curve ruler, weights, and tape measure. I had to buy more rulers, a notcher, an awl, and a handy-looking tool called a Simflex folding measure. I also – just now – ordered marking paper, used to develop first patterns from model measurements. I will use it to learn to create a basic pattern set. This handy tool helps to space buttonhole markings correctly. 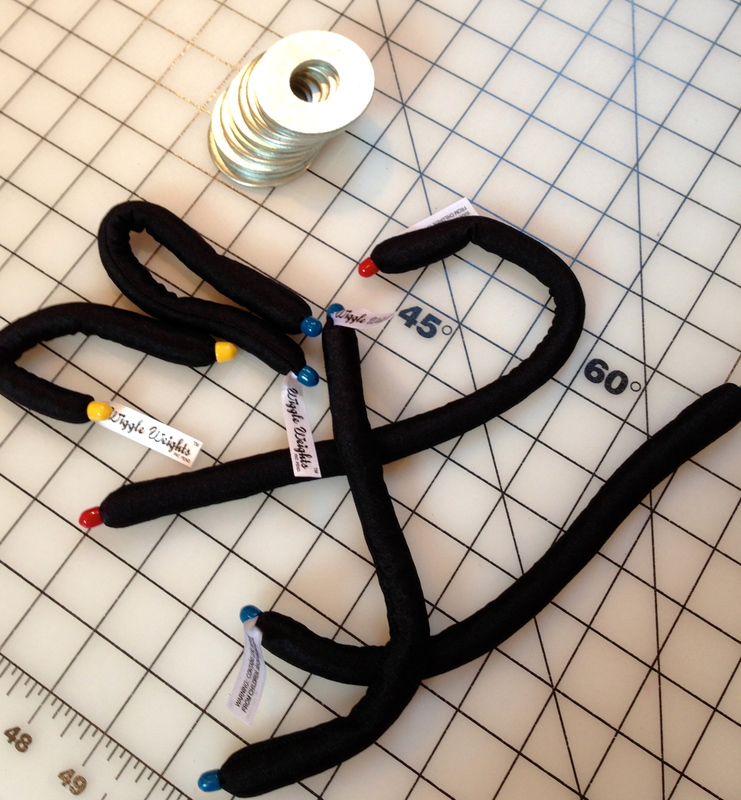 Weights are used in place of pins, for a quick way to cut patterns from fabric. Pictured here are 2″ washers, available from hardware stores, and Wiggle Weights that I bought at Atlanta’s Original Sewing and Quilting Expo last March. Tools pictured here are marking chalk and holders, used to mark fabric; an awl for punching holes in pattern paper to mark things such as the point of darts; and a notcher, used to notch pattern paper at strategic places. 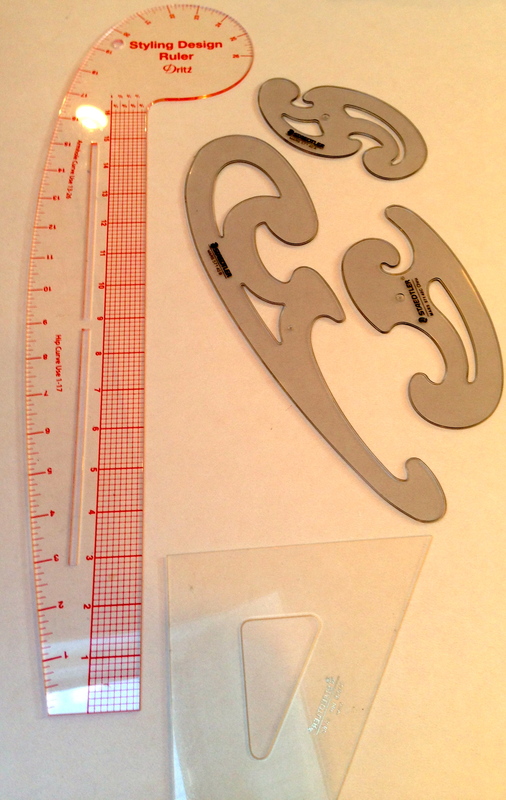 The French curve and other rulers are used to shape patterns at the armholes, hips, and other areas. Not pictured are the vary form curve and the hip curve, both of which I have on order. Most sewers will already have these items on hand: pins and holder, paper and fabric scissors, tracing wheel, and a variety of marking pens and pencils. The pens and pencils pictured here are for marking patterns, not fabric. Also listed as items needed in this chapter are push pins, stapler and staples, and black twill tape which is used on the dress form to mark style lines. The one thing listed that I am not going to purchase are hanger hooks or ringers. These are used to organize and hang patterns; I am not going into production anytime soon, so I don’t think I need this. 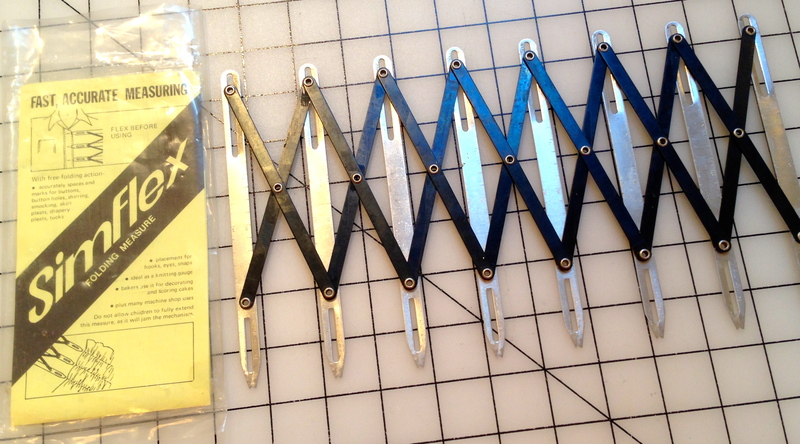 I will use, instead, skirt hangers with metal clips to organize my patterns while working my way through this textbook. So, gather the tools you need, and maybe this textbook, and let’s learn this process together! Next time, we will discuss some patternmaking terms from the second half of Chapter One.